We provide emergency water damage services to homes & businesses in Columbia, SC. You’ve probably heard of your friends or your family members encapsulating their crawlspaces and wondered if you should do the same to yours. At AdvantaClean of the Midlands, we strongly recommend going forward with the crawlspace encapsulation process because it can enhance the comfort of your home, lower your energy bills, and reduce the chances that you’ll need to do costly floor repairs. Additionally, if you plan on selling your home in the near future, an encapsulated crawlspace can be an attractive feature for buyers. When you make the final decision to encapsulate your home’s crawlspace, we’ll be there to help you every step of the way. This means that during the crawlspace encapsulation process, we’ll make sure things go smoothly, so you’re able to realize the many benefits that come from encapsulating this area of your home. This is just one of the many reasons why you should let us handle the crawlspace encapsulation process. At AdvantaClean of the Midlands, not only are we dedicated to quality workmanship, but we’re also committed to client education. For this reason, we’re always more than happy to answer any questions you might have about encapsulating your crawlspace or any of our other restoration services. 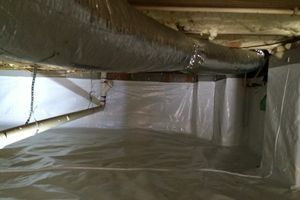 Remember, when it comes to encapsulating the crawlspace in your Columbia, South Carolina home, it’s always better to do it sooner rather than later. For more information about crawlspace encapsulation and our proven processes, get in touch with us at AdvantaClean of the Midlands today. At AdvantaClean of the Midlands, We provide Mold Remediation, Duct Cleaning, Water Damage Cleanup and Moisture Control to homes and businesses in Columbia, South Carolina. Let's put an end to moisture problems in your crawlspace! Fast Fact: Crawlspace Encapsulation Affects Your Indoor Air Quality! What Happens When You Need Mold Removal?